Sign up and receive Property Email Alerts of Houses for sale in Kleinmond, Kleinmond. This large family home in Klein Berlyn, Kleinmond, offers tranquil living close to the Kogelberg mountain range with views of the mountains and only bird song to wake you in the morning before a round of golf, within walking distance from your home. 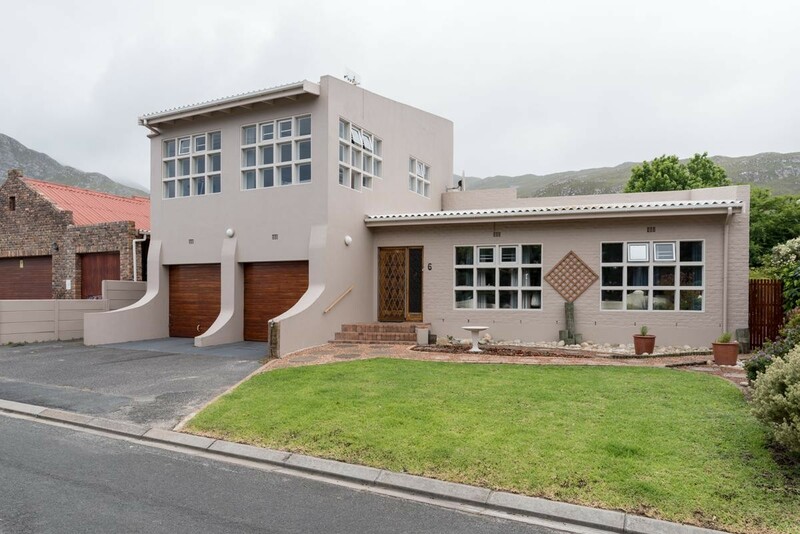 It comprises a lovely lounge area with wooden floors, a separate, open plan dining room, kitchen, a braai room with built-in braai and kitchenette, 4 bedrooms, 3.5 bathrooms, a large family room upstairs with views of the ocean and more space downstairs, which is currently divided into 2 extra bedrooms with a walk-in cupboard but will also make a lovely work room with ample packing space. The garden is very neat and can also be enjoyed from the Jacuzzi, with a sundowner in hand! A great advantage is also the proximity of a well-managed dual medium Primary School/Laerskool - within cycling distance to get kids to and from school without any hassle. Kleinmond is a beautiful little town situated on the Whale Coast route of the Western Cape where QUALITY OF LIFE gets a new meaning. It is situated inside a UNESCO-declared Biosphere about 90 km east of Cape Town. Great excitement brings nature lovers from all over the world to Kleinmond from June to November, when Southern Right Whales can be seen from the coastline. There are beautiful hikes in the Kogelberg Nature Reserve and also mountain bike trails all around. Close by is also a herd of wild horses known to roam free in the wetlands next to Rooisand Nature Reserve, believed to be South Africa's only herd of wild horses in a wetland habitat. Kleinmond's beach is a Blue Flag beach, popular with South African and foreign holiday makers. Sign-up and receive Property Email Alerts of Houses for sale in Kleinmond, Kleinmond.